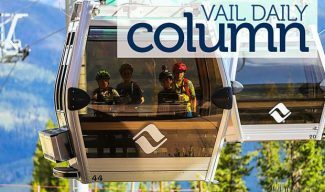 Representatives from the various local organizations that comprise the Eagle Valley Outdoor Movement collect a $1.4 million Inspire Initiative grant from Great Outdoors Colorado. 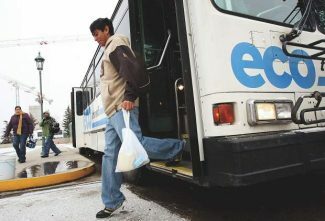 GOCO announced Friday that EVOM would be the recipent of the award. From left are Jason Brinkley, GOCO board chair; Markien Fedusiak, director of Walking Mountain Science Center; Linda Strand, GOCO board member; and Erika Meyer, GOCO use initiatives coordinator. DENVER — Kids from Edwards who don’t currently have ready access to the kind of outdoor recreational amenities many Eagle County youngsters take for granted just received a great, big, early Christmas gift — a $1.4 million Great Outdoors Colorado Inspire Initiative grant. 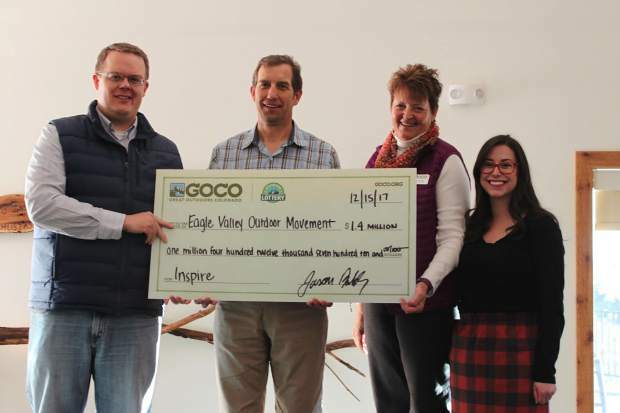 On Friday, Dec. 15, the GOCO Board awarded the $1,412,710 grant to Eagle County and a coalition of partners, called Eagle Valley Outdoor Movement, for the group’s work to get kids outside in Edwards. “I think that the most exciting thing about this program is it brings together a number of partners,” said Gina Van Hekken, of Walking Mountains Science Center. Through the Eagle Valley Outdoor Movement collaboration, Van Hekken said the groups involved can address a true inequity in our valley. 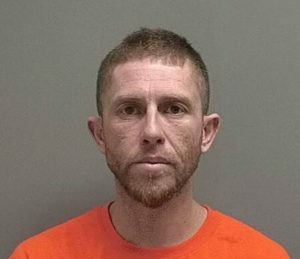 “We are actually going to focus on the west Edwards area and bringing outdoors opportunities to an overlooked part of our larger community,” Van Hekken said. The grant for Eagle Valley Outdoor Movement will help put into action plans that have been developed over the past two years. The coalition aims to provide equal access to outdoor opportunities for underserved youth and families in Edwards. The funding will address a variety of barriers to the outdoors, including lack of awareness of outdoor recreation opportunities, transportation, perceptions of risk and safety, time and costs associated with programs and equipment. The desired outcome is that area youth and families become interested in, understand and appreciate nature and experience the lifelong benefits of getting outside. Eagle Valley Outdoor Movement’s plans include providing places for free play in two neighborhoods: Lake Creek Village and Eagle River Village. New nature play areas and community gathering areas, a pump track and improved bike path access will provide youth with close-to-home destinations where they feel welcome and can build confidence in outdoor activities with their entire families. 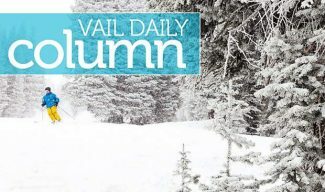 Eagle Valley Outdoor Movement partners have created a spectrum of educational programs — to occur during the school day and during out-of-school hours — with age-appropriate, outdoor learning and exploration opportunities for youth in preschool through 12th grade. In addition, partners will offer affordable programs to engage whole families. Eagle Valley Outdoor Movement will also provide internships and other leadership-development opportunities for high school students to apply learned outdoor skills and become leaders in the outdoors. Helping drive a new model for partnership between local government and community-based organizations, the coalition includes Walking Mountains Science Center as the coordinating hub, Eagle County Public Health and Environment, Eagle County Schools, YouthPower365 and SOS Outreach. Eagle Valley Outdoor Movement’s work will create 48 youth and community jobs and will impact 5,400 youth. 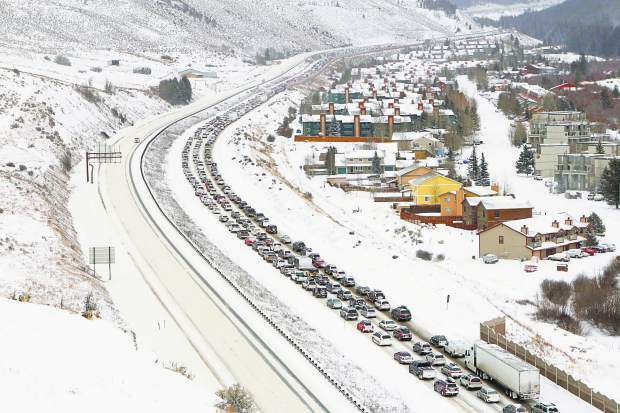 Eagle County’s grant is one of nine Inspire Initiative implementation awards made in this cycle, totaling $14.125 million. The funding brings GOCO’s investment in Inspire, to date, to more than $29 million. That figure includes a $4 million grant from the Colorado Health Foundation, a $75,000 grant from the Boettcher Foundation for rural communities and a $50,000 donation from DaVita. Inspire invests in places, programs and pathways to get Colorado kids and their families outside. The innovative framework is being looked at as a national model in connecting youth with the outdoors, and the participating communities’ approaches to addressing barriers to the outdoors will serve as examples to other rural, urban, suburban and mountain locales across the country. Through Inspire, community-based coalitions bring together representatives from local governments and organizations in the outdoor recreation, education and public-health fields, among others. Community members, including youth, have active roles in planning and implementation to ensure all Inspire projects meet their specific needs. To date, GOCO has invested $28.5 million in Eagle County projects and has conserved more than 4,500 acres of land in the county. GOCO funding has supported the Eagle Valley Trail, Eagle Valley Elementary School playground and the Eagle Information Center boat ramp eddy, among other projects. Great Outdoors Colorado invests a portion of Colorado Lottery proceeds to help preserve and enhance the state’s parks, trails, wildlife, rivers and open spaces. GOCO’s independent board awards competitive grants to local governments and land trusts and makes investments through Colorado Parks and Wildlife. Created when voters approved a Constitutional Amendment in 1992, GOCO has since funded more than 5,000 projects in all 64 counties of Colorado without any tax-dollar support. Visit goco.org for more information.